A stay at CABINN Aarhus Hotel places you in the heart of Aarhus, steps from Aarhus Theater and Viking Museum. This hotel is 0.1 mi (0.2 km) from Women's Museum in Denmark and 0.2 mi (0.3 km) from Aarhus Cathedral. Make yourself at home in one of the 126 guestrooms. Cable television is provided for your entertainment. Bathrooms have showers and hair dryers. Conveniences include desks, housekeeping is provided daily, and irons/ironing boards can be requested. With a stay at Wakeup Aarhus, you'll be centrally located in Aarhus, steps from Bruun's Galleri and within a 10-minute walk of Aarhus City Hall. This hotel is 0.5 mi (0.8 km) from ARoS and 0.7 mi (1.1 km) from Musikhuset Aarhus. Don't miss out on recreational opportunities including a sauna and a fitness center. This hotel also features complimentary wireless Internet access, a television in a common area, and tour/ticket assistance. 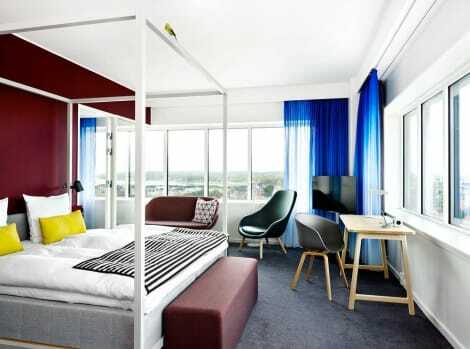 This designer hotel is only 300 metres from Aarhus Train Station. It offers free Wi-Fi internet access and free tea/coffee around the clock. All rooms have a flat-screen TV. City Hotel Oasia’s guest rooms feature classic Nordic design with light wooden flooring. All have luxury beds by Hästens, and some have designer chairs from Theselius and Kjaerholm. City Hotel Oasia is 350 metres from the shopping centre, Brunn’s Galleri. The shuttle buses for both Aarhus and Billund Airports are also a short walk away. A stay at Comwell Aarhus places you in the heart of Aarhus, within a 10-minute walk of Bruun's Galleri and Dokk1. This 4-star hotel is 0.5 mi (0.8 km) from Aarhus City Hall and 0.6 mi (0.9 km) from Viking Museum. A stay at Scandic Aarhus City places you in the heart of Aarhus, within a 5-minute walk of Aarhus Art Building and Aarhus City Hall. This 4-star hotel is 0.5 mi (0.7 km) from Dokk1 and 0.6 mi (0.9 km) from ARoS. lastminute.com has a fantastic range of hotels in Aarhus, with everything from cheap hotels to luxurious five star accommodation available. We like to live up to our last minute name so remember you can book any one of our excellent Aarhus hotels up until midnight and stay the same night.